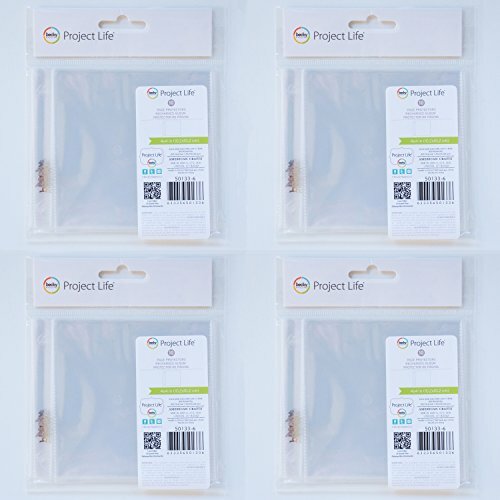 Becky Higgins Project Life 4 x 4 Page Protectors - Instagram Photo Sleeves - 4 Pack of 10 by Becky Higgins at Marco Marcucci. MPN: BEN0107. Hurry! Limited time offer. Offer valid only while supplies last. These Page Protectors are perfect for holding your 4'' x 4'' photos or cards - such a fun size and perfect for photos printed from your Instagram feed! These Page Protectors are perfect for holding your 4" x 4" photos or cards - such a fun size and perfect for photos printed from your Instagram feed! Use with any of our 4" x 4" Project Life albums (not included). Package contains (10) 4" x 4" Page Protectors. These Page Protectors are perfect for holding your 4" x 4" photos or cards - such a fun size and perfect for photos printed from your Instagram feed! Use with any of our 4" x 4" Project Life albums (not included). Package contains (10) 4" x 4" Page Protectors. If you have any questions about this product by Becky Higgins, contact us by completing and submitting the form below. If you are looking for a specif part number, please include it with your message.